Cochlear implants are devices that enhance the perception of sounds when placed in an appropriate location within the ear of a patient. Cochlear Implant candidacy is based on several factors from age, health, extent of hearing loss and more. They are used to treat patients whose deafness is associated with the loss of function in nervous tissue involved in hearing. This is known as sensorineural deafness, or SNHL. SNHL may result from a genetic disorder (i.e. a congenital defect). It is the most common cause of congenital sensory loss that is apparent at or after birth. SNHL in infants may also result from factors such as trauma, low birth weight, oxygen deprivation and infection. However, up to 30% of these cases have no known cause. SNHL is measured in the levels of ‘pure tones’ (sounds at frequencies of 500, 1000 and 2000Hz respectively) that a patient can hear. The average ‘scores’ of pure tones heard by a patient are converted to decibels (or decibels per hearing level (dBHL)), a standard unit used by doctors involved in treating deafness (audiologists). An average of 21 to 40 dBHL is classified as mild SNHL, whereas one of 41 to 70 dBHL corresponds to moderate SNHL. Patients with average scores that are any higher than this are classed as having severe (71-90 dBHL) to very severe (91 dBHL or greater) SNHL. 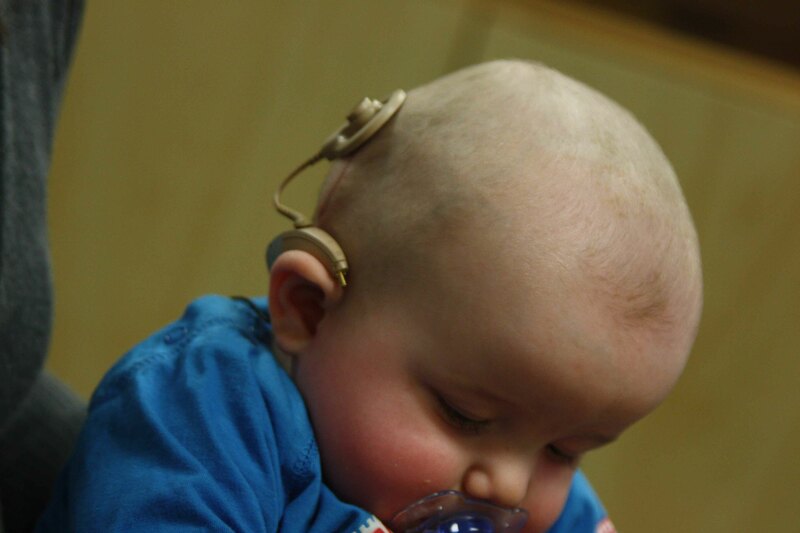 Surgeons are likely to be more wary when considering cochlear implantation surgery for a very small child. However, in the cases of infants with hearing loss, conserving the child’s development in terms of language and communication skills is an agenda that often outweighs the risks of surgery. This issue, as well as improvements in implant technology and surgical techniques, has contributed to the rapid reduction of the age at which an infant may undergo this surgery in recent year. Therefore, children of two years or younger with very severe SNHL that affects both ears are now possible candidates for cochlear implant surgery. Patients older than two years with severe to very severe SNHL are also eligible for this procedure. These patients may have SNHL in one (i.e. unilateral SNHL) or both (bilateral SNHL) ears, although some scientific reviews suggest that patients with bilateral SNHL may benefit more from the procedure. 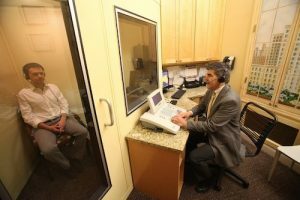 Before suggesting a cochlear implant, an audiologist may wish to eliminate the possibility of a patient’s compatibility and success with at least one type of external (i.e. a non-implant type of) hearing aid. If the patient does not show adequate hearing and language skill improvement in response to this treatment, the audiologist and the child’s parents (if applicable) may then discuss the risks and benefits of a cochlear implant. Patients who are suitable candidates must also be healthy enough to undergo general anesthesia safely. Prior to surgery, the requirements as above must be verified. The surgeon must also ensure that the patient and/or their parents also understand that the implant may not produce the expected results. Although the cochlear implant has demonstrated success in many cases, the results have also been observed to vary between individual patients. If you have any questions about Cochlear Implant candidacy and would like to schedule a consultation with the leading New York City hearing specialist, please feel free to call Dr. Kohan’s office for an appointment at (212) 472-1300.